The Footlights cast in costume for Pygmalion which is coming to the Lancaster Grand Theatre. Lancaster Footlights is to return to the stage with the company’s first show of the year, Pygmalion. 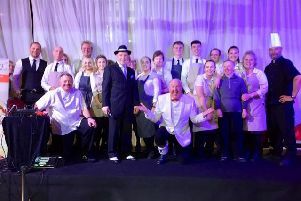 The show, written by George Bernard Shaw, is to be held at Lancaster Grand and to celebrate on the opening night there will be a free slice of cake and a cup of coffee with every ticket purchased. Pygmalion was first performed in 1913 and tells the story of Henry Higgins, a linguistics professor, who bets that he can pass off Eliza Doolittle, a Cockney flower seller, as a duchess after six months. The story of Pygmalion is also known from the musical adaptation, My Fair Lady. The cast include familiar Footlights members as well as some new faces, including Esmee Fitton who is currently a student at Lancaster Girls Grammar School and said she was delighted to be playing Eliza Doolittle, describing it as one of her dream roles. The cast will be wandering around Lancaster city centre in costume on Saturday, April 8. Lancaster Footlights is excited to have Hannah McNaughton, who is a new director to the theatre, and graduated with a degree in Theatre Studies from the University of Glasgow. Pygmalion will run from Tuesday, April 18 to Saturday, April 22 at 7:30pm. Tickets cost £10/£9 and are available online at www.lancastergrand.co.uk, or by calling 01524 64695 or visiting the box office on St Leonard’s Gate.